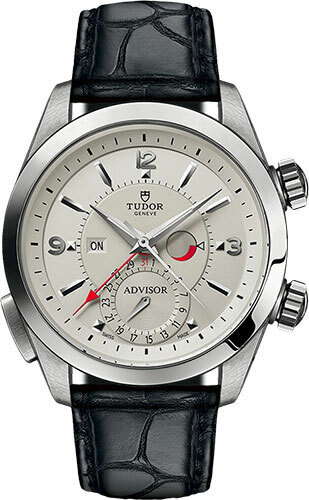 42 mm polished and satin finished titanium and steel case, steel crown with the tudor rose, steel winding crown at 2 o’clock for the alarm function, steel pusher at 8 o’clock to activate the alarm function, smooth steel bezel, domed sapphire crystal, silver dial with on/off indicator for the alarm function in an aperture at 9 o’clock, alarm power reserve shown on a disc at 3 o’clock, date hand and counter at 6 o’clock, Calibre 2892 self-winding movement with additional alarm function mechanism developed exclusively by TUDOR, approximately 42 hours of power reserve, black alligator leather strap, folding buckle with safety catch. Water resistant to 100 m (330 ft). 42 mm polished and satin finished titanium and steel case, steel crown with black-lacquered and engraved tudor rose, steel winding crown at 2 oíclock for the alarm function, steel pusher at 8 o'clock to engage the alarm function, polished smooth steel bezel, domed sapphire crystal, cognac dial with alarm function on/off display through an aperture at 9 o'clock, alarm power reserve indicator displayed on a disc at 3 o'clock, calendar shown by a hand at 6 o'clock, Calibre 2892 self-winding movement with additional alarm function mechanism developed exclusively by TUDOR, approximately 42 hours of power reserve, cognac alligator leather strap, folding buckle with safety catch. Water resistant to 100 m (330 ft). 42 mm polished and satin finished titanium and steel case, steel crown with the tudor rosesteel winding crown at 2 o’clock for the alarm function, steel pusher at 8 o’clock to activate the alarm function, smooth steel bezel, domed sapphire crystal, black dial with on/off indicator for the alarm function in an aperture at 9 o’clock, alarm power reserve shown on a disc at 3 o’clock, date hand and counter at 6 o’clock, Calibre 2892 self-winding movement with additional alarm function mechanism developed exclusively by TUDOR, approximately 42 hours of power reserve, black alligator leather strap, folding buckle with safety catch. Water resistant to 100 m (330 ft).